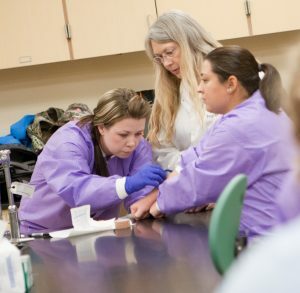 Students in our fully accredited Medical Laboratory Science (MLS) program receive extensive mentoring and hands-on experience at our partners in Yakima at Virginia Mason Memorial Hospital and Astria Regional Medical Center, in the Tri-Cities at Kadlec Regional Medical Center, Tri-Cities Laboratory, and Lourdes Medical Center and in Walla Walla at Providence St. Mary Medical Center in addition to their coursework. Students spend the first 18 weeks of the full academic program year in the classroom, then participate in a wide range of experiences within four different sections of area hospital labs. Upon graduation, students have a variety of career paths to choose from, and they are often recruited and placed in jobs due to the incredible demand for certified technologists. Through the sophisticated scientific tests technologists perform on blood, tissue, and body fluids, medical laboratory scientists (medical technologists) aid pathologists and physicians in the diagnosis and treatment of disease. Technologists are asked to perform complex analyses and make important decisions that affect patient treatment. In fact, many Medical diagnoses come from the work performed in medical labs. Technologists must be able to see the interdependence of the test and know the physiological conditions affecting test results. To achieve this, they use many sophisticated instruments and procedures to perform a variety of laboratory tests in the areas of Medical chemistry, blood banking, hematology, and microbiology. Because of their education, medical laboratory scientists can establish and monitor quality control programs and write/update medical procedures as needed. They are often promoted to supervisory positions and can go into education, sales, research, the military (officer) or even on to medical school. The MLS program at Heritage is accredited by the National Accrediting Agency for Medical Lab Sciences (NAACLS).